- tourist visa valid 30 days (20US$) extendable one time for 30 days (45US$). - business visa valid 30 days (25US$) extendable up to 1 year (cost depending on the extension period). Documents required: 1 form, 2 photos, valid passport during 6 months at the date of arrival in Cambodia, appropriate sum. If you enter Cambdia via the border town of Poipet from Thailand, the cost of one <tourist> visa is 1000 Baths and one <business> visa is 1200 Baths, higher costs than here-above mentioned, due to the exchange rate US$/thai Bath (1US$ changes around 30Baths at the end of November 2010). The local Authorities do not accept US$ for payment and that allows some officials to fully take advantage of the exchange rate. If your visa has expired, it will cost 5US$ per day of overstay then 6US$ per day, retroactivly to the first day of overstay, if you have not regularized your situation within a period of 30 days. An other way to get a visa is by internet; just follow the link hereafter and get it online http://www.mfaic.gov.kh/evisa/. That will avoid you queue up at your entry point of Cambodia. No vaccination is required in Cambodia. Nevertheless, it is highly recommended to safeguard against tetanos, hepatitis A & B, thyphoid. If you travel to certain remote regions, the vaccines against rage, japanese encephalitis and flu are advised. Tropical climate in Cambodia, very hot in summer (mid-March to end of May). In your bag, think of placing an anti-mosquitoes lotion, sunglasses, a hat ... before traveling. Customs : you will have to fill in a declaration form at your entry into Cambodia. Avoid heavy luggage. The weight allowed for checked luggage on domestic and international flights is 20kgs per person. International Airport tax : 25 usd / person at Phnom Penh and Siem Reap, now included in the air ticket price as of April 1st, 2011. 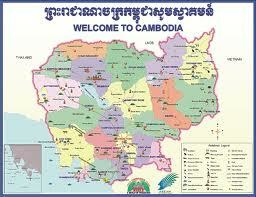 Domestic Airport tax : 06 usd / person at Phnom Penh and Siem Reap, now included in your air ticket bought in Cambodia.. The normal check-in times at airports is 2h for international departures and 1h for domestic departures. But, due to tougher security measures it is advisable to come sufficiently in advance to avoid queuing. Credit cards : you may obtain cash advance with your credit card at the local banks, the standard charge begins at 2%. Most stores, hotels and travel agencies accept payment by CB but will add a 4 - 5% commission to the final bill. There are now automatic teller machines in the main towns of Cambodia. Traveller's cheques : banks and large hotels will accept payment by traveller's cheques and charge a 1 - 2% commission. Cash : it is important to bring small denominations of US$ for your current expenses, they are accepted and preferred everywhere. The local money-changers, usually located around the markets, have better rates than banks. Internet and telephone : it is the cheapest way to communicate with your beloved ones, there are numerous internet shops and cafes throughout Cambodia. Photographies, films and processing: it is not necessary to bring a lot of films to Cambodia as they can be found everywhere and are very cheap. CAVAR TRAVEL & TOUR will do the best and make efforts to book hotels requested by clients; sometimes, hotel bookings cannot be guaranteed and alternative hotels will be used and booked.